The living room is one of the hardest-working rooms in the house and to light it effectively you'll need everything from overhead lighting (with a dimmer) for occasional use to table lamps for atmosphere. 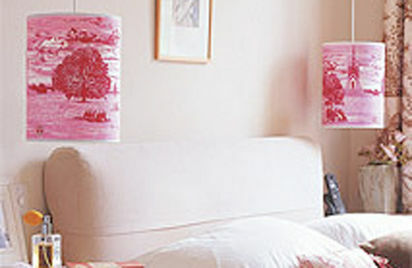 Think dramatic, whether with eye-catching central shades, table or floor lamps. One hot look is to group lights together in clusters, particularly pendants, usually in odd numbers, and to hang them low over focal pieces, such as the coffee table. If you're decorating the room from scratch, it's a good idea to plan where your lighting points and sockets should be installed at an early stage. This will mean that the lighting will suit your major pieces of furniture and not the other way around, and you won't have to trail unsightly cables across the room. Also, consider arranging for your table and floor lamps to be wired on their own separate circuit with dimmer switches, so you'll be able to control them all from one neat place on the wall. There is no greater crime than lighting your living room with a single pendant alone, so aim to use a variety of sources to create pools or different levels of light around the room. That means a central pendant for general ambient light; uplighters, table or tall floor lamps to light up dark corners; task lighting (such as table or desk lamp) for reading by; and perhaps a selection of wall lights to show off your favourite pictures. Providing light for practical purposes is always a priority, but you can use simple tricks to change a room's proportions, too. Fitting uplighters to the wall to bounce light onto the white ceiling will make the room seem larger and taller. Creating panels or shafts of light with downlighters at the far end of a short room will draw your eye towards it and make it seem longer, just as lighting all four corners of a small room will make it seem bigger. In a living room, it's worth highlighting favourite pictures, books, and even plants or pieces of furniture. A simple way to show off books is to clip a small spotlight to the underside of a shelf, while pictures can be picked out with a simple spotlight, but if they're glazed you'll need to use an 'eyeball' light that swivels and can be set to a broad beam. Even your houseplants can look quite dramatic when properly lit - the best way to do it is to put a low uplighter or floor-recessed spot right behind an impressive specimen and let the light bounce off the leaves. Similarly, your best pieces of furniture can be made into even more of a focal point by placing a striking and decorative lamp alongside them.